Digital learning in mainstream schools is harder to characterize than digital learning in non-traditional online and hybrid schools, because digital learning in mainstream schools takes so many forms. Instructional strategies vary in digital learning and include but are not limited to teachers’ use of online software to help students with skills in math and ELA, laptops and tablets in 1:1 and BYOD (bring your own device) programs, and supplemental online courses for students seeking additional credits or advanced courses. This section explores district digital learning programs for which the district has a name and a web presence. These tend to be among the best planned district programs, with clear educational goals, timelines, professional learning opportunities for teachers, and other program factors correlated with success. This section includes reference to, but does not focus on, district-run programs that fall into other categories such as district online schools, statewide online schools, and hybrid schools. This section also does not go into depth on teacher or student views of online learning, as views of mainstream teachers and students are available elsewhere on this site. Supplying credit recovery programs for at-risk students. Few data sources exist to quantify digital learning activity in these areas. We can, however, draw general comparisons and conclusions between different grade levels, and between districts of different sizes. 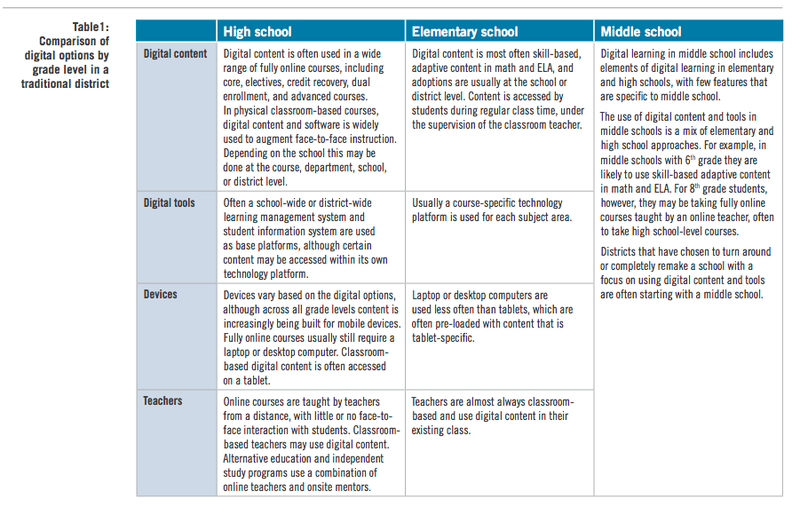 The most common types of digital instruction vary significantly between high schools, middle schools, and elementary schools (see Table 1 below). Online courses that include an online teacher are most common at the high school level. These may be focused on one type of student (i.e. advanced courses or credit recovery) or may be wide ranging (i.e. core and elective courses). Online courses are often coordinated at the district level and taken by students from multiple schools. In some cases the district offers enough online courses to provide a student’s entire education online for hospitalized, homebound, pregnant, incarcerated, or other students in similar uncommon circumstances. Credit recovery courses that may have an online teacher, or may have a site-based facilitator who serves as the teacher of record, are a common starting point for high schools offering online courses. The district may coordinate credit recovery options but have the courses available at multiple high schools so that students at each school can access them. An alternative education or independent study program may exist for students who wish to pursue their education in a setting other than a traditional high school. These programs usually do not follow a regular daily schedule, but include an onsite component and an online component. Digital content used in classrooms can be used to augment courses that are offered on a traditional daily and semester schedule. Content may be acquired from an outside provider, or developed by teachers for their own courses. Middle school digital instruction contains some elements of both elementary schools and high schools, partly because of the transitional ages of their students. Sixth grade students, if they are using digital learning, are most likely to be using skill-based software; 8th grade students may be taking high school courses online in order to advance their learning trajectory, particularly in math. District size has considerable implications for digital learning, including the level at which decisions are made. Small districts (up to about 2,500 students) are typically less significant users of digital content and tools than larger districts. The smallest districts are often in remote areas and may have little or no digital learning due to the lack of availability of digital learning delivery capability and/or Internet bandwidth constraints. Small and remote districts that are in states that invested in video conferencing often use it instead of online content. In small districts with good Internet access, online courses are often an important method by which the district augments the small number of courses offered by the district’s own schools. Small districts are unlikely to develop their own content or have their own teachers instructing online courses, and therefore tend to use online courses and teaching that is offered by private providers or state virtual schools. These districts are also less prone than larger districts to be using skills software for math and ELA courses in elementary and middle schools. 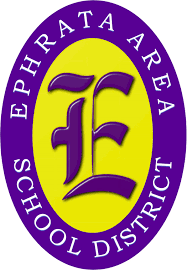 Because the smallest districts have few full-time district level administrators, it is rare for them to have someone who is dedicated to managing digital learning across the district, and the provision of devices and infrastructure (if being done) often falls to someone with less experience and expertise than a person in a similar position in a larger district. Most mid-size districts have a wider variety of digital content and tools available to students than small districts, but still do not often have the full range of digital instruction found in larger districts. They may offer one type of digital content to elementary students, and have some online courses available for middle and high school students, particularly for credit recovery. Districts in this category that have multiple middle schools and multiple high schools may be moving low enrollment courses online because they have enough students in the district, but not enough students in each school, to fill a course. Mid-size and larger districts often have district-level administrators and staff focused on curriculum and instruction, technology, and other areas that pertain to digital instruction. Districts of this size that adopt digital learning as a key strategy are able to dedicate a person—or more—to the effort; this person may coordinate the acquisition of content, devices, professional development, and the other building blocks of digital instruction. These districts would also be more apt to have their own teachers developing digital content and courses, and teaching online courses, although they are almost always using some vendor-provided online courses and teaching as well. All large districts—roughly 25,000 students and higher—are using some digital content and tools. Because districts of this size have multiple schools that tend to have some autonomy in their content and technology selections, district administrators may not readily know the extent to which digital content and tools are being used across the entire district. The district may have a coordinated digital learning strategy that includes, for example, a virtual high school and a digitally-focused turnaround middle school, while also having many other digital content providers and devices used in individual schools with little district-level coordination. In addition, these districts may have an alternative education school or program that is likely using some online courses for students who are not attending a traditional school during the full extent of regular school days and hours. Large districts almost certainly have district-wide instructional and student information platforms, and will have some teachers developing course content within the system. Although district size is generally predictive of the level of digital learning activity in the district, we find digitally advanced districts of all sizes. These forward-thinking districts have multiple digital options that often include the creation of and/or provision of supplemental online courses for credit recovery and original credit, a virtual school for students who wish to take all of their courses online, digital content for students in classrooms within middle schools and elementary schools, a way to provide devices (tablets or computers) to all students, extensive professional development for teachers, and support mechanisms in place to assist teachers and instructional leaders with the shift to integrating digital content and tools into classrooms. While many districts have been using digital content and tools for years, most are still in the early stages of creating or rolling out dedicated online programs and inaugurating major changes in their instructional models in order to incorporate a significant portion of digital learning in their core instructional programs. Finally, many districts that have a range of options usually don’t have them across all schools.